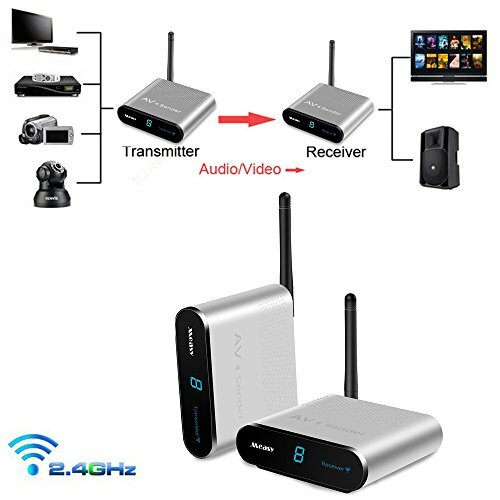 MEASY AV220 wireless AV transmitte and receiver enable you satisfy the transmission of A/V device and digital TV STB device. It enables you to easily realize wireless sharing of HD AV data and enjoy untrammeled hi-fi audio and visual effects. The transmitter and the receiver are used in the same channel in a pair and can be used in the modes of point-multipoint or multipoint-multipoint. Compatible with DVD, DVR, CCD camera, IPTV, satellite STB, digital TV STB and other AV output devices. Supports video transmission of PAL/NTSC system and stereo audio transmission. Wireless AV transmission solutions are suitable for large video meeting systems and multimedia class rooms. With an external CCD camera, it can realize real-time field image monitoring in applications such as security system. It can also be used in AV transmission applications where the AV cabling is difficult or expensive. It transmit AV signals by means of radio waves and can be used for wireless sharing of AV signals of DVD, DVR, CCD camera, IPTV, satellite STB, digital TV STB and other AV devices of several TV sets. Support 8 groups of channels. You can select these channels to avoid interference from signals of a wireless router, etc. If you have any questions about this product by Measy, contact us by completing and submitting the form below. If you are looking for a specif part number, please include it with your message.